Enjoying the Present (Senior) Moment. How many friends have ridden my Grandfather Horse over the years? I lost count a decade ago. He is even older than his age implies, but right now, in deep summer, his eye is kind and there’s no reason to complain. Days are long and life is good. He gets a special breakfast mush, supplements to help him, stirred into alfalfa to settle his acid stomach. He has become a slow, distracted eater, dropping most of it on the ground, so I pull him out of his pen where he can eat alone. Some days he waits by the gate, if he remembers that breakfast feels like preferential treatment. Other days he seems to be daydreaming. I slide on the halter, and this horse, who has shadowed my every step for over a quarter of a century, won’t move. Maybe he hurts too much or just doesn’t want to go. When he was a colt, I put a come-along around his spotted rump to help. Now, I wait, and cluck, and eventually he shifts enough weight to take a step. Eventually he moves with me again. Senior moments keep us connected, I appreciate them. My vet says that horses don’t get dementia, that instead he is probably losing his eyesight. I wonder what the difference actually is. Either way he is disoriented. Either way he loses confidence. I wish I believed it was as simple as blindness. Tuesday the feed pan was just a bit out of place and he got rattled. He backed up, hit a hay tarp and froze. Maybe the fly mask makes it worse. I caught the lead rope and that kind of frightened him, too. I thought he knew where I was, but maybe not. Then he let me help him find breakfast. If it’s a slow day at the farm, I close the front gate and let my Grandfather Horse spend the morning in a grazing stroll. Sometimes he ends up standing in an open stall. He stays stuck there with no worries, until I come and turn him around toward the gate. In order to be a good rider, humans have to learn to be in the present moment, not languishing in the past or dreaming about the future. Certainly not thinking about work, or what some man did. The young Grandfather Horse required a lot of focus from his rider, with an in the instant connection. His confidence depended on mine, and the truth is, it still does. He has always made me stronger than I am. This old gelding has intermittent diarrhea now. Too much information? Well, we are too old to be shy or embarrassed. We ran out of superficiality years ago. I do what I can to help him, but a change of any sort seems to bring it on, even the weather. Every few days, I clean him up. His tail is thick, it takes a bit of work to ease the clumps of manure free. How many times have I washed his tail over the years? He has always been vain, flashing it with each emotion. He said more with his tail than most folks do with an entire vocabulary. His tail has things to tell me still. Lord knows, I’m an old gray mare myself. It isn’t the worst thing. If I can wait out the blank look that lingers, the random indifference, then I am gifted with an unbearable sweetness as he remembers me. Is this grace? Has grace filled in the missing gaps for him, like it does for me? His lessons with me are not done yet, I doubt I will ever know all he knows. Maybe the real reason to learn to be in the moment while riding, is so that when this moment eventually comes, it can be shared, forever long, too. With no worry, the future will take care of itself. Celebrating the golden moment of endless summer with my Grandfather Horse is enough right now. Reading this just totally broke me this morning. 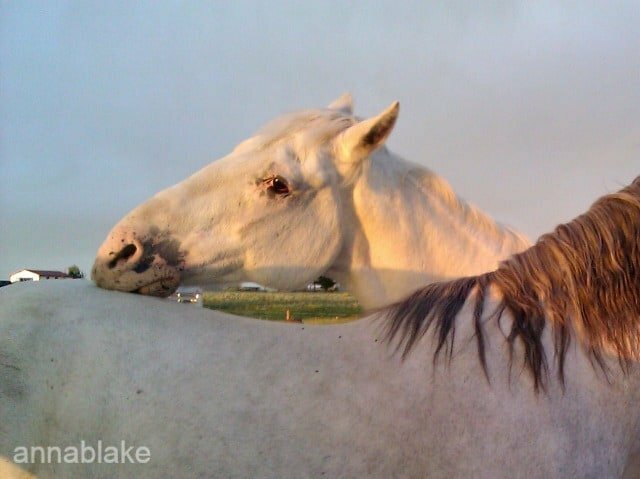 I was thinking yesterday that I’ve come to the realization that I’ll never stop missing my old mare. (Come to think of it, I’m not even sure why I ever thought I would?) She too, had senior diarrhea the last two years or so of her life. We “blamed” it on everything except old age. Denial is like that, I guess. My blind, senior Cattle Dog developed senior dementia. He was quite adorably lost at times, but he too would just patiently wait for one of us to gently put him right. He was never very flustered by anything in his lifetime, so it didn’t surprise me that he took it all in stride. Senior animals have much to teach us about aging, I think. Thanks for sharing this with us. I’m touched. Beautiful Anna. I hope I can share such senior moments with my horse someday.